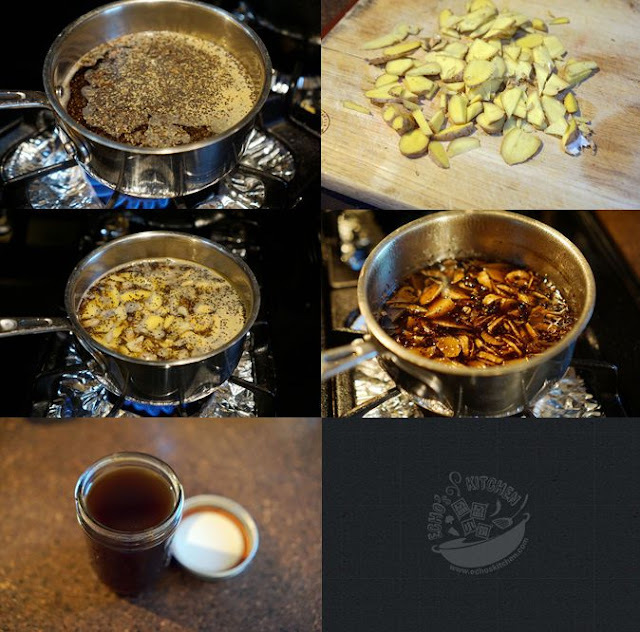 My husband loves Spiced tea and could have it several times a day. I used to grudge at the chore of repeatedly boiling and cleaning the utensils to make tea. Then one day when I was making this Mint Syrup , it suddenly dawned on me that I can also infuse spices in Syrup and make tea with it!! That way, I can make as many teas as hubby liked and not having to wash pots several times a day! So I didn't wait too long to take this thought into action, I made a jar of Spiced Syrup and made Tea for my husband, he couldn't tell the difference from boiling the spices in water! 1. 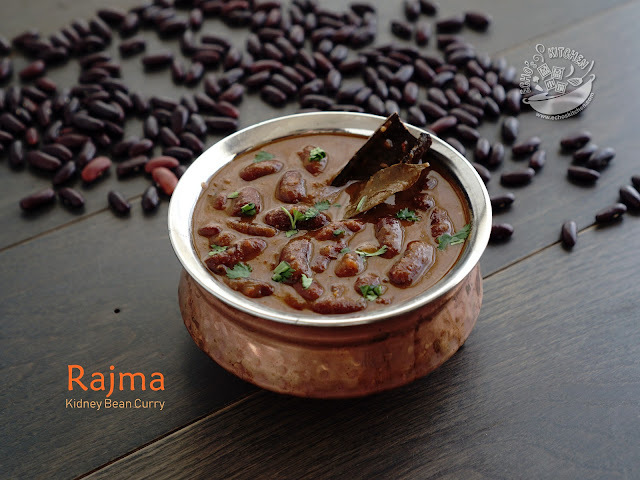 Place water, sugar and spices in a sauce pan, cut ginger roots into small pieces and place it in the same pan. 2. Bring to boil and continue cooking at medium low for 30 minutes until the Syrup slightly thickened. 4. 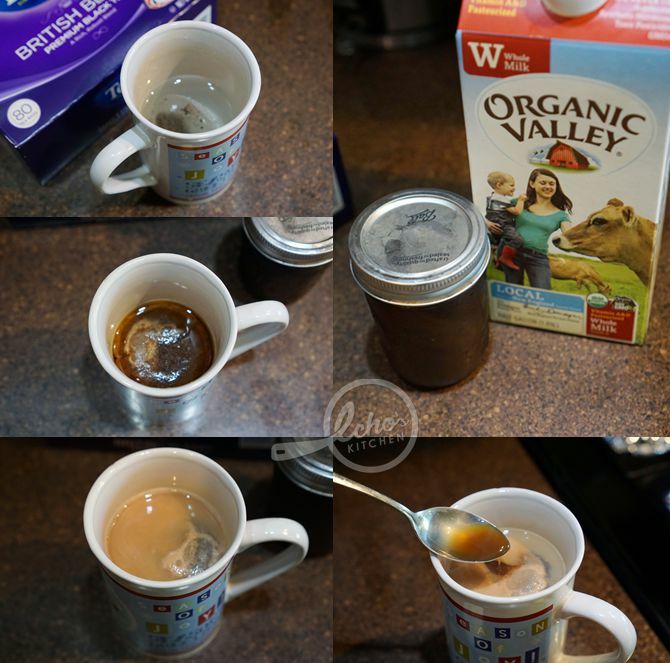 Store the syrup in a mason jar and refrigerate it, use 1-2 tsp whenever you need it. 5. 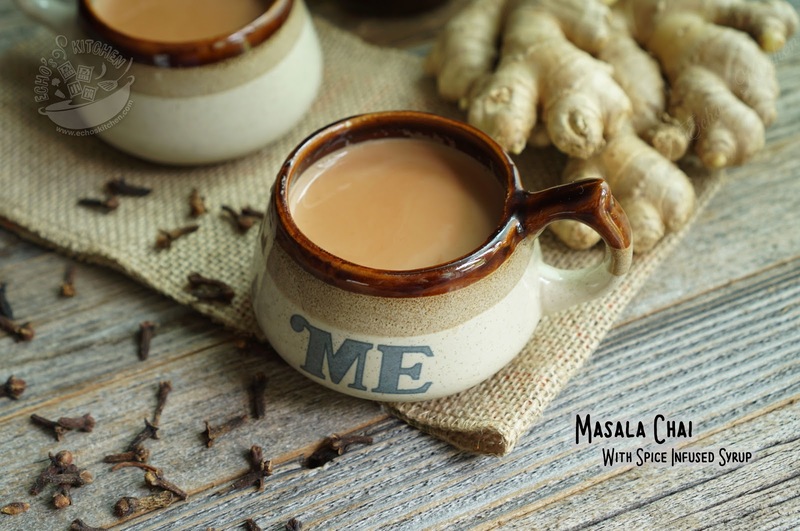 To make Masala Chai, just place 1 tea bag in 2/3 cup of water and microwave it for 1.5-2 minutes depending on your microwave voltage. Let the tea steep for 2-3 minutes. 6. Add two tbsp of whole milk, microwave it for 30 seconds if you prefer your tea to be hot. 7. Remove the tea bag and add 1-2 tsp of Spiced Syrup depending on the spice lever and sweetness you like and enjoy!! Thank you! They said laziness makes you creative!